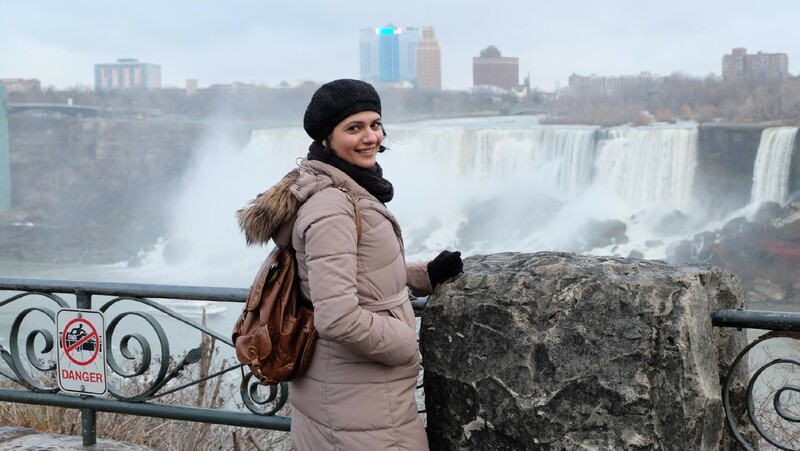 My cousin decided that we should visit the Niagara Falls the day after I reached Canada because the weather was going to be good, max of 2 degrees Celsius. Ha! So off we went the next day. It was a 1.5hr drive to the falls and we used this time to catch up on how life has turned out for us.I was seeing my cousin after 8 years and I had never met my sister in law before. My cousin and I were very close while growing up. Our families have taken few trips together of which we still have very fond memories. Over the years we sort of lost touch (I can be so bad at keeping in touch with people) but it seems like the bond we shared while growing up was strong enough to withstand the 8year gap. When we met this time it was like we were simply picking up from where we left off. So during the drive we talked of all the silly stuff we did as kids, what we’ve been up to after we left school and after we left India. I also used this time to get to know my sis-in-law. 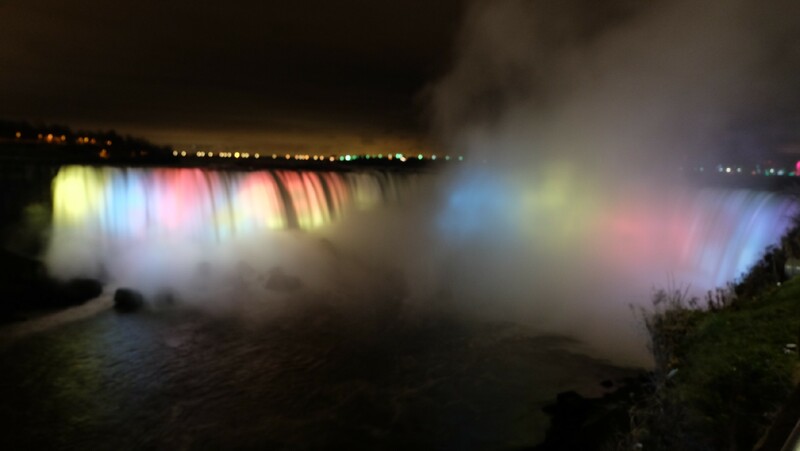 Once we’d reached Niagara, we parked in one of the Casinos there and walked down to the fall. The snow flurries had started while we were driving but luckily the flurries stopped during our walk down to the falls. It was still extremely cold and after a 10 minute walk I decided to get a warm drink. We entered one of the local coffee shops and I asked for a soy latte and I was told they didn’t have soy milk. So we tried Tim Hortons next which is apparently the most popular chain of coffee shops in Canada and they didn’t have soy milk either (are no Canadians lactose intolerant?!) Anyways, I found a Starbucks and bought my favourite chestnut and praline latte (which is no longer my favourite as I think I drank it one too many times) and continued with the walk to the falls. So Niagara falls is made up of 3 falls; the Horseshoe falls, the American falls and the Bridal Veil falls. 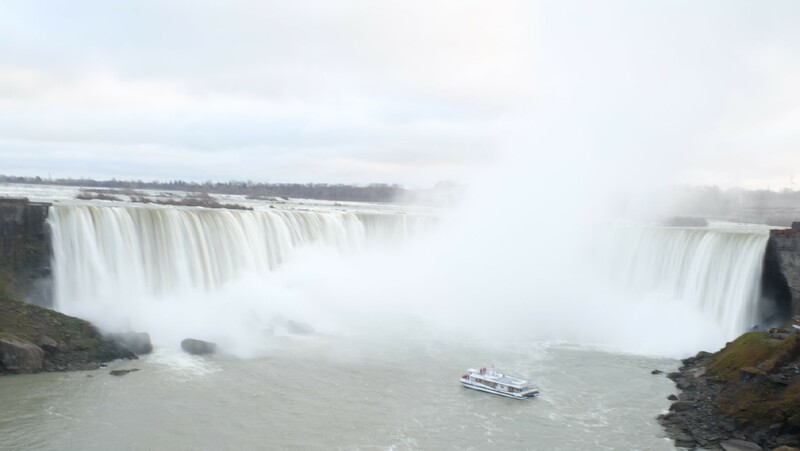 The Horseshoe falls lie mostly on the Canadian side and the other two are entirely on the American side. The falls can be viewed from America where I *guess* you’d be looking sideways at the falls or from Canada where the falls would be on the opposite side. We were on the Canadian side. The falls were beautiful. They were scary. And as someone who cannot swim (I know I know, it’s on my to-do list) looking at the powerful waterfalls was truly astounding. We didn’t do much except stroll along the walkway and take loads of pictures. We could have gone to the Skylon Tower which offers the highest overhead view of the falls or to the observation deck which gives an illusion of being within the falling waters but we did neither because a) I didn’t know about any of these and b) it was so freaking cold and windy that 15mins after we reached the falls we had to head to the shopping plaza next door where I had to wait for around 15 agonizing minutes before I could start feeling my toes and fingers again. After we were thawed enough we decided to head back to the casino where we spent some time (I was bored after spending $5 in there, so not my thing). When my cousins lost enough money we went to their favourite Indian restaurant, Guru http://www.welcometoguru.com/, where we had an absolutely delicious dinner. I highly recommend their Tandoori Chicken, Dal Makhani and salted lassi! After dinner, we drove back to the falls as I wanted to take some night time pictures. I took as many as I could but it had gotten even colder after dark (duh!) and I decided that I needed my toes more than a good picture so I hopped back in the car and we were on our way back home!